Run Wiki is hosting a virtual race called Kyle's Krusade. She organized a virtual race to raise money to help out Kyle and his family. You should read about Kyle's story here. He's a 6 year old fighting for his life against the battle of cancer. For only a $10 donation (or more if you'd like), you are helping out a sweet little boy and his family. On Wednesday I was feeling sore and tired. I didn't really want to run. But I had already planned it in my head that it was going to be the day I ran for Kyle. Because I stand by my commitments, I ran. Untimed. It was a thoughtful run. I thought about this little boy I've never met and the difficulties they are going through. I realized that all of my "problems" combined could never compare to their difficulties. I cried. I felt selfish for ever feeling bad for myself. Then I felt grateful for my own children and the joy they bring to my life and how lost I would feel without them in my life. 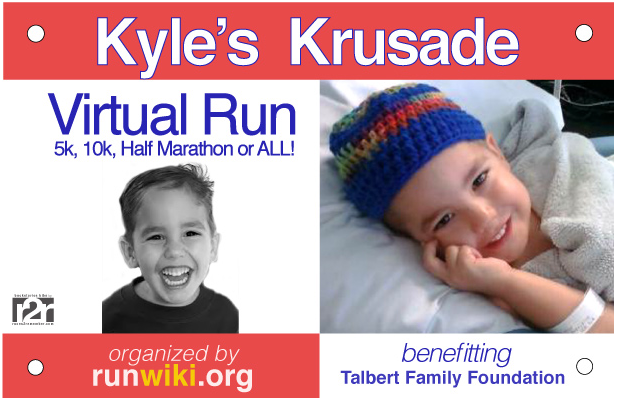 I prayed many times for Kyle and his family during that run and then for all families going through difficult times. If you haven't registered for this virtual race yet and want to, there is still time. The virtual race runs from February 1st through the 16th and the link is right here. 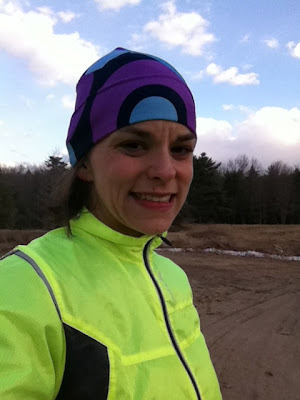 Thank you, Lisa, for organizing this race and opening it up to the running community. Thank you so much Jen! I am so grateful to you and all of the runners who participated in this event that is so close to my heart. I did mine this week, too! Lovely cause... Lisa's an inspiring lady, too. Great job, Jen! I ran a 5K this morning for Kyle. So glad I participated and great job getting your race in too!